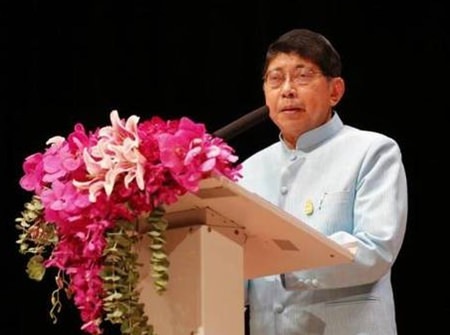 BANGKOK, 29 July 2015 – Deputy Prime Minister Wissanu Kreangam has suggested that Thai people should be aware of the correct and proper use of the Thai language during the 2015 National Thai Language Day event. The deputy PM on Wednesday presided over a ceremony to grant awards to people who had used the Thai language exceptionally well at the National Cultural Center in Bangkok. He said many Thai people today unnecessarily used foreign words when speaking and writing Thai and made new words, especially in social media. He then suggested everyone speak and write grammatically correct Thai and help set an example for the proper use of the language. Apart from the award presentation ceremony, the national Thai language day event this year featured traditional musical and performance competitions in honor of Her Royal Highness Princess Maha Chakri Sirindhorn.